Bernadette's canonization in 1933 was the culmination of a process which had been started nearly three-quarters of a century earlier: she is, therefore, a saint of modern times, and the remarkable facts of her life are readily accessible to all. Her story even challenges the interest of those who do not share the Catholic faith. Christianity had its beginnings among humble people without influence or riches, such as Bernadette. Perhaps it is a natural human instinct to rejoice when the lowly are lifted up to the heights, and especially when a child, neglected and untaught, is chosen for special grace and favor, thus becoming an instrument for good. Born in Lourdes, France, on January 7, 1844, Bernadette was the first child of Francois and Louise Soubirous. At the time of her birth, Francois was a miller, operating a mill which had belonged to his wife's people. He was a good-natured, easy-going man, with little ability for carrying on a business, and before many years the mill had been forfeited for debt. During most of Bernadette's childhood he was an odd job man, picking up a day's work as opportunity offered, and, from time to time, escaping from his problems and responsibilities by turning to the delusive comfort of alcohol. His wife and children, naturally, were the chief sufferers from his ineffectualness. Louise, whose family was of somewhat better economic status than her husband's, was a hard worker, a warm-hearted neighbor, and exemplary in her observance of Catholic rites. Within a short space of years many children were born to her, only five of whom survived infancy. After Bernadette, there was another girl, Toinette Marie, and three boys. To help feed and clothe them it was often necessary for their harassed mother to go out to work by the day, doing laundry and other rough tasks for the more prosperous citizens, and, on one occasion, at least, helping to harvest a crop of grain. A peasant woman of the region has told of seeing little Bernadette, then about twelve, carrying the youngest baby to Louise in the field, to be nursed during the noon-day rest period. As a child, Bernadette not only did more than might be expected in caring for the smaller children, but helped in their moral and religious training as well. Bernadette was never strong, and from the age of six she showed symptoms of the respiratory ailment that later became a chronic affliction. It is not clear at this early stage whether she suffered from asthma or tuberculosis, but we know that her mother was anxious about her health and made an effort to provide special food for her. When Bernadette was thirteen she was sent to the neighboring mountain hamlet of Bartres, to the home of one Marie Arevant, her foster mother. It was here that Bernadette had been taken for a few months when she was still an infant, to be nursed by Madame Arevant, who had just lost a baby. The woman now had a large family and little Bernadette made herself useful in the house and in the fields. One of her duties was to tend a small flock of sheep that grazed on a hillside nearby; it is this brief phase of her girlhood that has inspired artists to picture her as a shepherdess. Her life was a lonely one, and we get the impression that she was overworked and homesick while she remained in this peasant home. At all events she sent word to her parents that she wished to leave Bartres. One thing seemed especially to disturb her at this time; although she was now fourteen, she had not made her First Communion. Her foster mother had tried half-heartedly to prepare her, but after one or two sessions had impatiently given it up, saying that Bernadette was too dull to learn. When Bernadette went back to Lourdes, it made her very happy to be admitted to the day school conducted by the Sisters of Charity and Christian Instruction. This was a teaching and nursing order whose mother-house is at Nevers, in central France. A hospice, a day school, and a boarding school were maintained at Lourdes by these devout nuns, who were, as a group, unusually well trained. Thus Bernadette at last began her secular education, and, under Abbe Pomian, continued to prepare for First Communion. She was also learning a little French, for up to this time she spoke only the local dialect. The nuns discovered that beneath a quiet, modest exterior, Bernadette had a winning personality and a lively sense of humor. This might have been a happy and constructive time for the little girl had it not been for the ever-increasing shadows of poverty at home. After moving from one poor location to another, the Soubirous family was now living in a single room of a dilapidated structure in the rue des Petits Fosses; this damp, unwholesome place had once served as a jail and was known as Le Cachot, the Dungeon. Above loomed an ancient fortress, and the narrow cobbled street had once been a part of the moat. The town of Lourdes, itself very old, is situated in one of the most picturesque parts of France, lying in the extreme southwest, near the Spanish frontier, where the Pyrenees mountains rise sharply above the plains. From the craggy, wooded heights, several valleys descend to converge at this site, and the little river Gave rushes through the town, its turbulent current turning the wheels of many mills. There are escarpments of rock in and around Lourdes, the most famous being the Massabeille, a great mound jutting out from the base of a plateau. On the side facing the river it had an arch-shaped opening which led into a sizeable grotto-a grotto that was soon destined to become famous in every part of the world. At this time the Massabeille had, if not exactly an aura of evil, a touch of the sinister. According to legend, it had been sacred to the pagans of prehistoric times; now it served as a shelter for fishermen or herdsmen caught by sudden storms. It was very cold on February 11, 1858, the day that was to mark the beginning of such an extraordinary series of events at the rock of Massabeille. When Bernadette returned from school her mother gave her permission to go down by the river to pick up driftwood and fallen branches. Toinette Marie, aged nine, and Marie Abadie, aged twelve, a neighbor's child, went with her. When the three girls reached the Massabeille, the two younger ones took off their wooden shoes to wade across an icy mill-stream which here joined the river. Bernadette, more sensitive, hung behind. Standing alone beside the river, she had started to remove her stockings when she heard a noise like a sudden rush of wind. Looking up towards the grotto she saw some movement among the branches, then there floated out of the opening a golden cloud, and in the midst of it was the figure of a beautiful young girl who placed herself in a small niche in the rock, at one side of the opening and slightly above it. In the crannies around this niche grew stunted vines and shrubs, and in particular a white eglantine. Bernadette, staring in fascination, saw that the luminous apparition was dressed in a soft white robe, with a broad girdle of blue, and a long white veil that partially covered her hair. Her eyes were blue and gentle. Golden roses gleamed on her bare feet. When the vision smiled and beckoned to Bernadette, the girl's fear vanished and she came a few steps nearer, then sank reverently to her knees. She drew her rosary from her pocket, for, in moments of stress, she habitually said her beads. The mysterious being also had a rosary, of large white beads, and to quote Bernadette's own account: "The Lady let me pray alone; she passed the beads of the rosary between her fingers, but said nothing; only at the end of each decade did she say the Gloria with me." When the recitation was finished, the Lady vanished into the cave and the golden mist disappeared with her. This experience affected Bernadette so powerfully that, when the other girls turned back to look for her, she was still kneeling, a rapt, faraway look on her face. They chided her, thinking she had passed the time praying to escape the task of gathering fuel. Tying up their twigs and branches into faggots, they started for home. Too full of her vision to keep quiet about it, before they had gone far Bernadette burst out with the whole wondrous story; she asked the girls to say nothing at home. But Toinette told Madame Soubirous that same evening, and soon the news spread further. Bernadette wished to go back to the Massabeille the next day, but her mother, after talking the matter over with a sister, refused her permission. Bernadette now showed the independence of spirit-some were to characterize it as obstinacy-that became one of her outstanding traits. When she told her confessor of the apparition, Abbe Pomian made light of it, thinking the girl suffered from hallucinations. Nevertheless, on the following Sunday Bernadette asked if she might go to the grotto and her father told her she might go if she took a flask of holy water with her, to exorcise the apparition should it prove to be a demon. Bernadette, advancing ahead of several little friends who accompanied her, knelt before the grotto and soon the vision appeared as before. On their return the excited girls, although they had seen nothing, naturally began to tell their versions of the affair, and soon the town buzzed with varying reports and rumors. On the next market day the peasants heard of these strange happenings. The story reached the Mother Superior of the convent, who took a firm stand: she announced to the class preparing for Communion, comprising Bernadette's friends and companions for the most part, that they must stop talking and thinking of this matter. Bernadette's teacher, Sister Marie Therese Vauzous, was even hostile. The apparition was manifest to Bernadette for the third time on Thursday, February 18, when she went to the grotto accompanied by two women of Lourdes who thought the "damiezelo," as Bernadette called her, was the returning spirit of a young woman, one of their dear friends, who had died a few months before. On this occasion the same little figure appeared to Bernadette, smiled warmly, and spoke, asking Bernadette to come every day for fifteen days. Bernadette promised to come, provided she was given permission to do so. Since neither her god-mother, who was her mother's sister, nor the priest actually forbade it, Bernadette's parents offered no objection. On the following day her mother and aunt went with her, and on subsequent visits great crowds of people gathered on the Massabeille, or down by the river, hoping to see or hear something miraculous. During these two weeks the excitement increased to such a pitch that the civil authorities felt obliged to take action. The police were not content to threaten the Soubirous family; they must take Bernadette to the local police office for questioning and try to make her admit that it was all an elaborate hoax. Bernadette emerged from this and many another ordeal somewhat shaken but obdurate. The authorities continued to try to discredit her. They even gave currency to the report that the whole thing had been thought up by Bernadette's poverty-stricken parents, so that they might derive some profit from it. Francois and Louise Soubirous, from being puzzled, worried, and uncertain at the outset, had now come to believe in the supernatural character of their daughter's experiences, and stood loyally by her. They did not dream of exploiting the affair in their own interest. As a matter of fact, pious, well-meaning people were bringing them gifts of money and food, sometimes asking for a token from Bernadette. These offerings were declined; even Bernadette's small brothers were cautioned to accept nothing. The girl herself was adamant in her determination to have no part in any kind of trafficking; the record of her complete honesty and disinterestedness is clear and unquestioned. However, she found the sudden notoriety unpleasant, and this sensitivity to being stared at and talked about and pointed out was to last throughout her life. People began to gather at the grotto in the middle of the night, awaiting her appearance. It was rumored that she had a miraculous, healing touch. Several cures were attributed to her. On Sunday, February 21, a number of persons went with her to the grotto, including citizens who had been highly skeptical. On this occasion, Bernadette reported later, the apparition said to her: "You will pray to God for sinners." On February 26, while she was in the trance-like state which lasted as long as she saw the vision, Bernadette crawled inside the grotto, and, at the Lady's bidding, uncovered with her bare hands a little trickle of water from which she drank and with which she bathed her face, still at the Lady's direction. This tiny spring continued to well up and by the next day was flowing steadily down into the river: to this day it has never ceased to gush forth from the grotto. The people regarded its discovery by Bernadette as a miracle. On March 2 Bernadette saw the apparition for the thirteenth time. It was on this day that the Lady bade Bernadette to tell the priests that "a chapel should be built and a procession formed." Bernadette had no thought but to obey, in spite of the open hostility of the cure of Lourdes. Dean Peyramale, an imposing man of excellent family and background, received Bernadette and reprimanded her harshly, asking her to inquire the name of her visitant, and to tell her she must perform a real miracle, such as making the eglantine bloom out of season, to prove herself. During the preceding weeks he had ordered the priests to have nothing to do with the grotto, for it was the general practice of the clergy to discourage or ignore religious visionaries. Very often such persons were ill-balanced or suffering from delusions. As a matter of fact, Bernadette's experiences were proving contagious, and before long many others, young and old, were claiming to have had supernatural visions at the grotto and elsewhere. Dean Peyramale's stand of determined opposition was based on the necessity of restoring order in the parish. On March 25, Lady Day, Bernadette started for the grotto at dawn. When the vision appeared to her, Bernadette said: "Would you kindly tell me who you are?" When the girl had repeated the question twice more, the Lady replied: "I am the Immaculate Conception. I want a chapel here." This answer, when reported by Bernadette, caused the local excitement to rise to a still higher pitch and the feeling grew that Bernadette's visitor was the Blessed Virgin. Only four years before the dogma of the Immaculate Conception had been promulgated. The seventeenth apparition took place on April 7, and the final one, more than three months later, on July 16. By that time, the grotto, which the people were trying to make into a sanctuary and place of worship, had been barricaded by the town authorities to discourage worshipers and curiosity-seekers from congregating there. During the twenty-one years that she was to remain on earth, Bernadette never again saw the vision. The accounts of what she had seen and heard, which she was obliged to repeat so often, never varied in any significant detail. Meanwhile the news of the phenomenal happenings at Lourdes had reached the very highest ecclesiastical and government circles: the bishop, the prefect, even Emperor Napoleon III and his pious wife Eugenie, became actors in the drama. On October 5, the mayor of Lourdes, on orders from above, had the grotto reopened. It was thought that the empress herself had had a voice in this decision. At all events, it seemed to be the only appropriate response to the overwhelming demand of the people for a shrine Bernadette's visions, the new spring, and the cures that were being reported, all had taken a profound hold on the popular imagination. Due to a lucky turn, Bernadette's family was now more comfortably situated, and, to escape visitors, Bernadette went to live at the convent. Even there, intrusions upon her privacy were allowed; these she bore as patiently as she could. While her fame not only continued but steadily grew, Bernadette herself withdrew more and more. At the age of twenty she decided to take the veil. Since the state of her health precluded the more ascetic orders, it was considered best for her to join the Sisters who had taught and sheltered her. At twenty-two, therefore, she traveled to the motherhouse of the convent. Her novitiate was full of trials and sorrows. Acting under the quite unfounded notion that Bernadette's visions and all the attendant publicity might have made the young woman vain or self-important, Sister Marie Therese Vauzous, now novice-mistress at Nevers, was very severe with her former pupil. Although she made life difficult for Bernadette, the little novice met all tests with perfect humility. She cheerfully performed the menial tasks assigned to her, at first in the convent kitchen, although this work must have taxed her strength. Later, when it was noted that her sympathetic manner made her a favorite with sick people, she was appointed assistant infirmarian. Her step and touch were light, and her very presence brought comfort. But during these years, Bernadette was suffering from the chronic disease which was slowly draining her life away. She was finally given work in the sacristy, where cleverness with the needle made her work admired and cherished. She displayed a real gift for design and color in embroidering the sacred vestments. To all tasks she brought a pure grace of spirit and an utter willingness to serve. In September, 1878, Bernadette made her perpetual and final vows. Her strength was ebbing away, but even when she was confined to wheel chair or bed, she went on with the fine needlework. And now she had more time for prayer and meditation. There is little outward drama in the life of a nun, but in Bernadette's case there was steady activity, steady growth, in things of the spirit. She had been told by her vision that she would not attain happiness in this world. Her childhood had been sad, and maturity had brought no easing of the burden she must carry. During the last two years of life a tumor developed on one knee, which was followed by caries of the bone. She suffered excruciating pain. One day, when a Superior came to visit her and said, "What are you doing in bed, you lazy little thing?" Bernadette simply replied, "I am doing my stint. I must be a victim." She felt that such was the Divine plan for her. The nuns, the novice mistress, and the Superior had all long since come to regard her as the vessel of Divine grace and to believe in the reality of those visitations of her youth. She still suffered from the curiosity of visiting strangers. 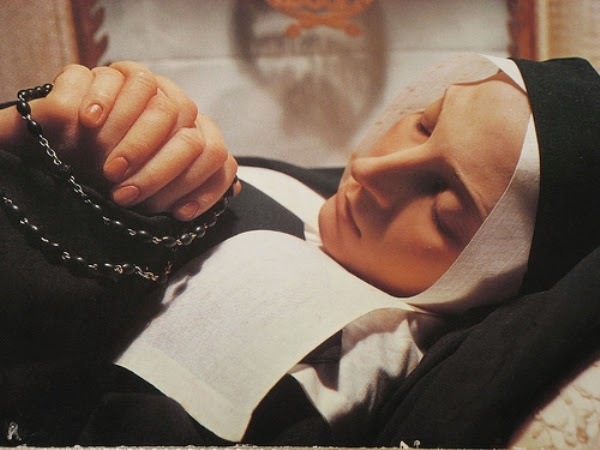 Not only did nuns and priests come to Nevers but celebrities from Paris and other parts of France came to see for themselves the now famous Bernadette. Disliking publicity as she did, yet not wishing to remain isolated and aloof if a glimpse of her could help or inspire any other human soul, she met this test too-and sometimes with a native cleverness. Once a visitor stopped her as she was passing down a corridor and asked where she could get a glimpse of Sister Bernadette. The little nun said, "Just watch that doorway and presently you will see her go through." And she slipped away through the door. Such was the prestige her presence gave to the order that many young women now joined it. On her death-bed, in a spasm of pain, Bernadette pressed the crucifix closer to her, and cried, "All this is good for Heaven!" That afternoon, as the nuns of the convent knelt round her bed to repeat the prayers for the dying, they heard her say in a low voice, "Blessed Mary, Mother of God, pray for me! A poor sinner, a poor sinner-" She could not finish. The date was April 16, 1879. As soon as the news spread, people came streaming towards the convent, chanting, "The saint is dead! The saint is dead!" Bernadette's body was placed in a casket which was sealed, then buried near the chapel of St. Joseph in the convent grounds. When it was exhumed in 1908 by the commission formed to forward the examination of Bernadette's life and character, it was found to be intact and uncorrupted. In August, 1913, Pope Pius X conferred the title of Venerable upon her, and in June, 1925, the ceremony of beatification took place. Since then, her body, reposing in a handsome glass reliquary, lies in the convent chapel, guarded above by a statue of the Blessed Virgin, and by the nuns who keep vigil. In Rome, on December 8, 1933, the Feast of the Immaculate Conception, amidst a brilliant setting and the fanfare of silver trumpets, Bernadette Soubirous was admitted to the company of saints. This little nun, humble, unlettered, honest, and obedient, is venerated by the great host of Catholic worshipers throughout the world. Tens of thousands of them journey annually to the glorious shrine at Lourdes. The story of Lourdes as a pilgrimage place forms a strange contrast to Bernadette's retired life of prayer and service. Its growth from a sleepy country town to its present status as the most popular pilgrimage place in Christendom has been phenomenal. A railroad line from Pau was built, facilitating the influx of visitors who, from the very first year, were drawn to Lourdes. Dean Peyramale and his superior, the bishop of Pau, who at first had scoffed, came to believe most ardently; it was the aged dean who found the money for raising the great basilica to Our Lady, which was completed in 1876. Participating in the ceremony were thirty-five prelates, a cardinal, and three thousand priests. Sister Bernadette had no share in these rites. Another church at the base of the basilica was erected and consecrated in 1901. The entire district has been enhanced by architecture and landscaping to make it an impressive sanctuary, with a background of great natural beauty. Of the cures at Lourdes it can be said that even non-believers have observed something here that medical science cannot explain. The commission of physicians, known as the Bureau of Constatations, who examine evidence and report on their findings, operate with great caution and circumspection. The alleged cure must be immediate and permanent to be regarded as a miracle. Medical records prior to the trip are studied, as well as the patient's subsequent medical history. The patient may himself be a witness, and it is most moving to hear the words, "I was sick and now I am well," which give such comfort and hope to others who are ailing. Only a few cures each year stand up against these rigid tests, but those few are enough. The thousands-the lame, the halt, the blind -continue to come, to be washed in the waters of the spring, to share in the processions, the singing, the prayers, the impressive rites, and breathe the pure air of faith. The Canticle of Bernadette hovers in that air, and even those well persons who go to Lourdes simply searching for a renewal of faith find themselves amply rewarded, for the spirit of the child Bernadette is still a potent inspiration.